Please don’t eat it in the shower…. Or prepare it in the shower…. Get together and chit chat…. regular appearance these days, doesn’t it? just disregard the first rambling portion of this post. 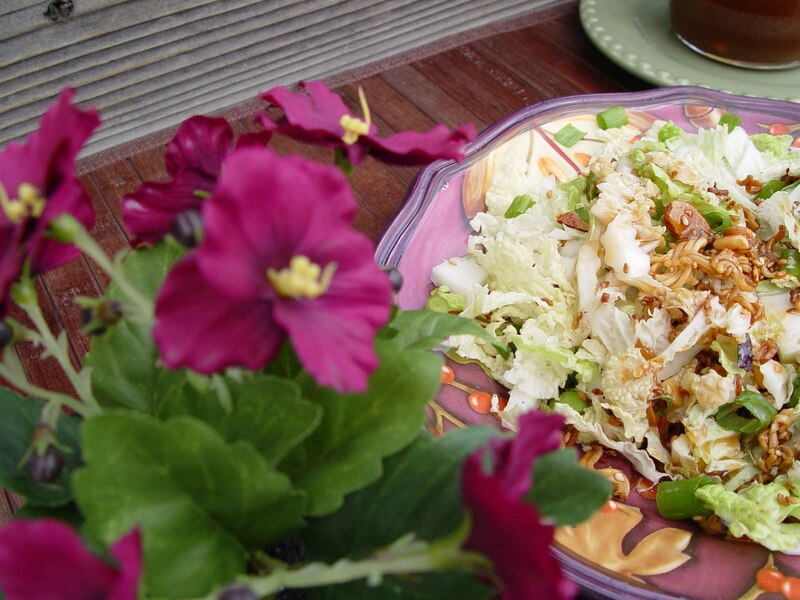 The fabulous Chinese Cabbage Salad recipe I’m sharing with you today has a little bit of unique twist. The dressing is made with a peanut oil base giving it a wonderfully rich flavor. Me either. The Peanut Oil distributors must have a secret loathing for all people living in Herriman. There is not a drop of Peanut Oil being sold within a 15 mile radius of my home. Yep. Times are tough, aren’t they. If you can’t get your hands on peanut oil….don’t worry about it. I’ve got a simple solution for you. Discussion on the simple solution to follow in the recipe portion. This salad has another little twist. of the traditional regular old plain green cabbage. Worried about finding Nappa Cabbage? Don’t be. I’ve never met a grocery store that didn’t carry it. This crinkly beauty is Nappa Cabbage. You can see that the leaves are a lot more porous than regular cabbage. What does this mean for you? These crinkly leaves are going to soak up more of the dressing. Lovely! Just what you were hoping to read about today….crinkly cabbage. Information like this can be life saving, you know. 1. Cut the tail end off of your cabbage and toss it in the trash. 2. Thinly slice the rest of the cabbage and place it into a large bowl. 3. Slice your green onions and add them to your bowl. 4. Open up your packages of Ramen Noodles…. place them in a gallon sized freezer zip lock bag and pound them into small pieces with a meat tenderizer. sesame seeds and ramen noodles. 6. Cook the mixture stirring frequently until everything turns a nice toasty brown. Set the crunchy mixture aside to cool. 8. Put the peanut butter/oil mixture into the microwave and heat it for 30 seconds. Stir it all around until the peanut butter dissolves. soy sauce and rice vinegar. 10. Bring the mixture to a rolling boil over medium high heat. Let it boil hard for one minute. Then set it aside to cool. 11. When you are ready to serve toss the cabbage and green onions with the crunchy ramen mixture and pour the dressing over the top to coat. Serve immediately. 4. Open up your packages of Ramen Noodles place them in a gallon sized freezer zip lock bag and pound them into small pieces with a meat tenderizer. 5. Heat a large skillet over medium high heat. Melt your butter and then add your almonds,sesame seeds and ramen noodles. 8. Put the peanut butter/oil mixture into the microwave and heat it for 30 seconds.Stir it all around until the peanut butter dissolves. 9. Into a medium sized sauce pan pour your sugar, your peanut oil (or your peanut butter/oil mixture) soy sauce and rice vinegar. What did you do with the flavor packet? forget my question. I read all the comments. Thanks. I made this tonight with a few changes and it was SO delicious. My husband and I absolutely loved it. I omitted the green onions because I don’t really care for them, used 1/4 of the butter called for and 2 pkgs of ramen noodles. I think the peanut butter is part of what makes this so good. Added my link! ..hope I did that right. I like using purple cababge in my green salads.. and a chicken n macaroni salad I make. Its a big one so I might have to find another use for it too! Jamie, I am obsessed with this dressing! I made a variation of it for Thai Chopped Salad and it is to die for. Thanks for sharing! Oh and this salad is so easy to make, it took no time at all for such sophistication. Do you have the nutritional information and/or Weight Watchers PointsPlus information for this recipe? I loved this dressing recipe but I found it too sweet for my liking. So I added 1/4 cup sugar instead of 1/2 cup. 2 Tbs of Sesame seed oil. 3 Tbs of sesame toasted sesame seeds, 3 Tbs of red pepper flakes, and an extra Tbs of rice vinegar. It was to die for and have made it three times this week! I am shocked that this recipe would tell people to toss a quarter of the cabbage in the trash. There are many uses for the rest of the cabbage. No need to waste perfectly good food. The recipe looks good though, can’t wait to try it. Love the recipe, and also a new substitution to keep in the file box. Great ideas, too, for additions, such as mandarin oranges and cilantro. Thanks for finally talking about > Chinese Cabbage Salad < Loved it! A friend made this for my shower and I loved it! I made it for a potluck today. I made the dressing with the peanut oil and it just didn’t taste right. So I did it with the PB and canola oil and it was SOOO much better! Don’t even bother buying the peanut oil. Go for the PB+canola oil version!!! Thanks for your feedback. So happy to hear it turned out well for you! I wanted to read and copy your cabbage salad but I was so annoyed by all the ads you lost me. How many is thus supposed to serve. We love this and have taken it to many potlucks. Now I am making it for a dinner service for 60 and I’m not sure how much to make. I would stick with regular peanut butter for this recipe.